Governor Jon Corzine was born on January 1, 1947, and grew up on a small family farm in the central Illinois community of Willey’s Station. His father farmed and sold insurance; his mother was a public school teacher. His interest in politics was forged in his farming community. It was there that he learned the meaning of hard work and the opportunities afforded by a strong education system. Governor Corzine graduated Phi Beta Kappa from the University of Illinois at Urbana-Champaign in 1969 and enlisted in the U.S. Marine Corps Reserves. He remained in the reserves until 1975, rising to the rank of sergeant in his infantry unit. After his active duty in the Marine Corps, he began his career in finance, working as a portfolio analyst at the Continental Illinois National Bank in Chicago. He enrolled in the graduate business school of the University of Chicago in 1970, first attending classes at night. He received his MBA in 1973, and went to work at Bank Ohio, a regional bank in Columbus, Ohio. In 1975, Governor Corzine was recruited by Goldman Sachs, the New York investment firm, and he and his family moved to New Jersey. He was named a partner at Goldman Sachs in 1980, and became chairman and chief executive officer in 1994. He left Goldman Sachs in May 1999 after successfully converting the investment firm from a private partnership to a public company. named by Time magazine as one of the top 50 technology executives in the country in 1997. As the chief executive officer at Goldman Sachs, Governor Corzine expanded the company’s community outreach and philanthropic programs, establishing a company-wide service program in which employees volunteer on a regular basis in their communities. Also in 1997, Governor Corzine was the chairman of a presidential commission to study capital budgeting as a means of increasing federal investment in schools, technology, and infrastructure. 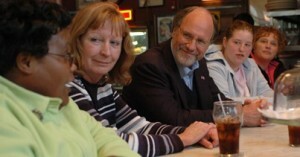 Jon Corzine was elected to the United States Senate in November 2000. During his time in the Senate, he focused on serving the state of New Jersey, applying his financial expertise to major economic and regulatory issues, and pushing a forward-looking, progressive agenda. As Senator he sought new federal investments in New Jersey’s transportation network, pursued new safeguards to protect chemical facilities against terrorist attack, introduced legislation to improve access to education and healthcare, fought for stronger environmental policies, and led the effort in Congress to crack down on corporate abuse. In a major victory, the Senate adopted Governor Corzine’s resolution declaring the need for new safeguards at the nation’s vulnerable chemical plants. He also secured federal funding toward the construction of a second railroad tunnel underneath the Hudson River, long sought by New Jersey’s congressional delegation, and won federal support for a wide variety of community and economic development projects throughout the state of New Jersey. In addition, to protect the environment and the economy along New Jersey’s shore, Governor Corzine fought to prevent any oil or gas drilling off the coastline. In 2005, Jon Corzine announced his candidacy for the governorship of New Jersey, promising to bring the same business practices and integrity that helped him run Goldman Sachs to state government. He built his campaign around his comprehensive ethics proposal, revamping the state’s property tax system, building a stronger economy, and improving education and healthcare. Jon S. Corzine was be sworn in as New Jersey’s 52nd Governor on January 17, 2006.